Journalist Jeff Benedict has spent more than two decades studying the link between football and crime. He has performed comprehensive criminal backgrounds checks on thousands of athletes, first for his book Pros and Cons and again as part of a 2011 Sports Illustrated article. Benedict says his research shows a pattern of poor behavior in athletes. He spoke with Bill Littlefield about that pattern and how it applies to former Patriots tight end Aaron Hernandez. 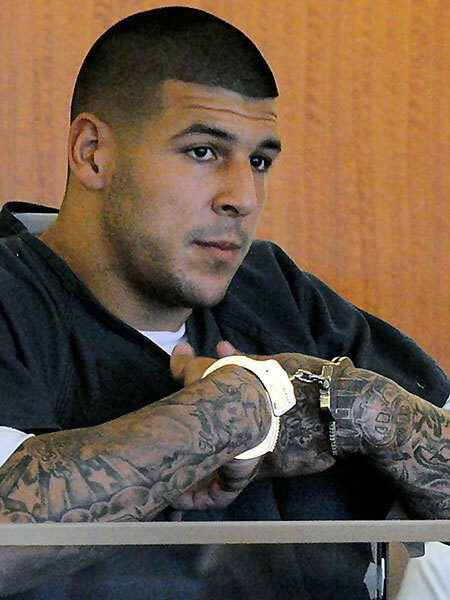 Elements of Hernandez’s past include the alleged shooting of a drug dealer in February, an arrest during his freshman year at Florida for a fight in an off-campus bar, and a one-game suspension the following year for a failed drug test. Benedict says Hernandez’s talent provided him with chances galore; first from Urban Meyer, whose Florida Gators won a national championship, and now with Patriots’ coach Bill Belichick. The Patriots’ gamble on Hernandez had paid off enough for the team to sign him to a five-year contract extension worth a as much as $40 million last summer. But, in Benedict’s eyes, all that money isn’t always good. When he first started researching athletes in trouble with the law, Benedict says willful ignorance was the norm in all sports. Today, the landscape is more encouraging. Roger Goodell took over as commissioner of the NFL in 2006. Benedict sees that year as a turning point for the league. Benedict draws a parallel between crime committed by athletes and the NFL’s concussion crisis. Both, Benedict says, reach deep into the community. “The NFL is no longer viewed as this game that we watch on Sundays. There are ramifications to these games: physical ramifications for those who play it and consequences for those in the game who have issues off the field.” Benedict said.